Firefighters battled extraordinarily large wildfires, ones whose smoke permeated nearby cities’ air, throughout mid-November. The Woolsey Fire in Malibu started on Nov. 8. As of Nov. 20, the fire was 96 percent contained according to calfire.gov. Another even more destructive fire occurred in conjunction with the Woolsey fire. Northern California’s Camp Fire has become known as one of the state’s most destructive, burning forest land for over 151,000 acres. As of Nov. 20, the fire was 75 percent contained. The fires killed over 60 people, and as of Nov. 19, hundreds are still missing according to a report by the Associated Press. 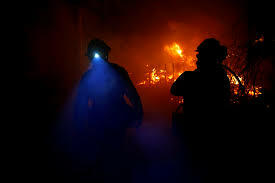 Statistics released by the Cal Fire organization state that the fire destroyed approximately 15,914 structures. Photographers who captured the fires took pictures which depicted an almost post-apocalyptic world. Images, such as the now famous one capturing three llamas sitting on a fire-engulfed beach by Los Angeles Times employee Wally Skalij, seem almost surreal. Jody Jones, Paradise’s mayor, has estimated that it may take over two years for her town, one of the hardest-hit by the fires, to repair itself. The fires not only affected publicly owned organizations but also caused irreversible damage to a multitude of individual homes and privately owned businesses. The RMS, a catastrophe modeler, estimated the fires to cost between $9 and $13 billion insurance dollars. The Camp Fire cost between $7.5 and $10 Billion dollars in damage alone. The fire affected Jewish community members at YULA along with other victims. About a dozen students and faculty members missed school on Friday, November 9, as they left their house due to dangers from the incoming fires. “It was scary [when I left my house for the fires],” said sophomore Sarah Cohn who had to evacuate her house due to the Woolsey fire. “We had to leave late at night, with all my stuff.” Dozens of students and faculty, just like Cohn, evacuated their homes with an uncertain future. Thankfully, Cohn’s home and possessions remained unscathed, but thousand were victims to unfortunate loss due the fire. ur. Although air quality was still okay to breathe, the unnatural climate served as an omnipresent reminder for the fires burning a dozen miles away. A menorah and a wooden sign which proclaims “Rabbi Alfred Wolf Inspiration Point” are the sole surviving camp relics as shown through a chilling image via Ben Posten in the Los Angeles Times. In addition to community centers, synagogues leaders were also affected by the Woolsey fire. Rabbi Michael Schwartz, Malibu Jewish Center and Synagogue congregations’ leader, lost his own home in the fires. “We lost pretty much everything, all our furniture, all our clothes,” Schwartz said in an interview with Jewish Journal reporter Ryan Torok. “Our ketubah (marriage certificate) [was an item] we forgot to take; quilts for each kid my mom made when they were born. Most painfully, or financially, my wife’s ceramics studio we had just finished setting up,” he said. According to the U.S drought monitor, as of Nov. 21, California State is 77.62 percent in drought and 22.14 percent of the state is in either serve or exceptional drought. These dry conditions make the environment more prone to wildfires, as the soil’s dryness allows the fire to spread and dry brush and plants facilitate the flames. Fires are a natural part of California’s ecosystem, but when heavily populated cities move closer to wildfire-prone areas in the time of climate change, these flames can heavily damage buildings, air quality, and even threaten human life itself.